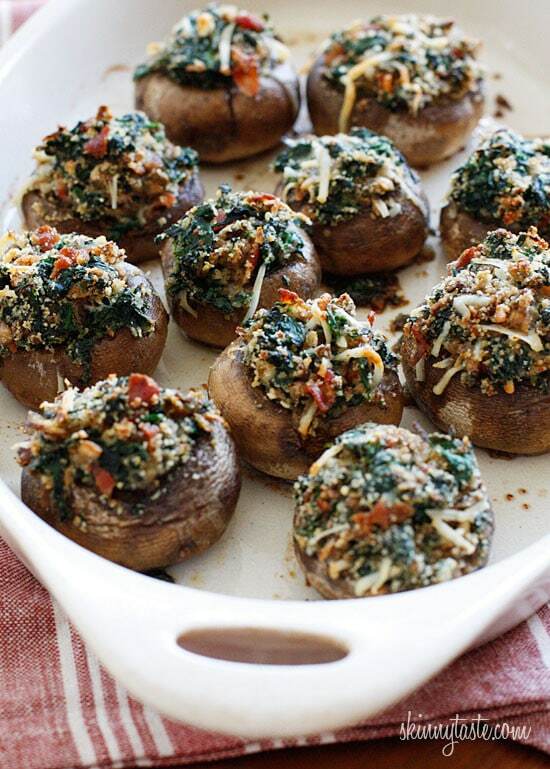 Spinach and Bacon Stuffed Mushrooms stuffed with sautéed baby spinach, chopped mushrooms, bacon, bread crumbs and Parmesan cheese – a lighter alternative to traditional stuffed mushrooms yet loaded with tons of flavor! The stuffing is so good, I could eat it by the spoonful! 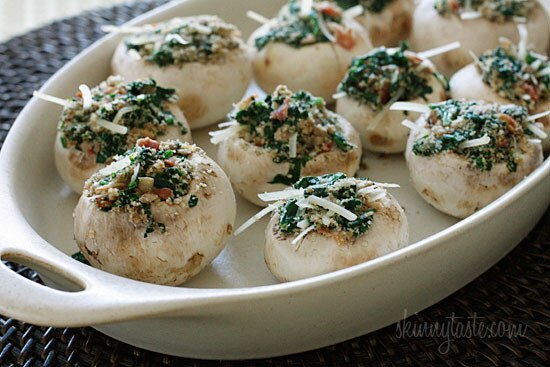 More mushroom appetizers you might also like Philly Cheesesteak Stuffed Mushrooms, Mushroom Ceviche or Lasagna Stuffed Mushrooms. I prefer the flavor of real bacon, so I buy center cut which is a bit leaner than regular bacon and I drain it well after cooking. Can you make them with turkey bacon? Sure, if you don’t eat pork that would work. To make these vegetarian, replace the bacon with a little Feta cheese and chopped fresh herbs. Can you make them ahead of time? Yes, you can prepare the stuffing ahead, then fill and bake them right before serving. Preheat the oven to 400°F. Lightly spray a foil lined baking pan or baking dish with cooking spray. 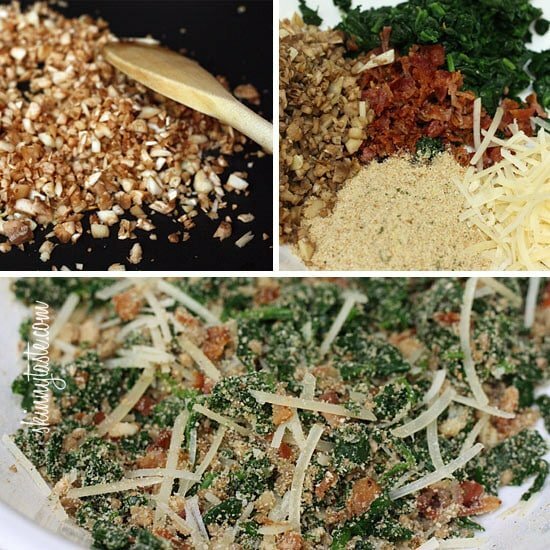 Remove stems from mushrooms and mince fine. Heat a medium sized skillet. 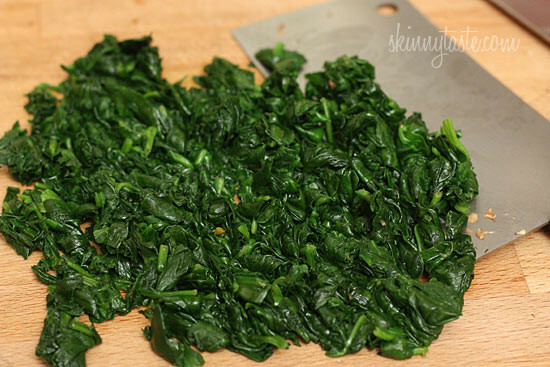 Rinse spinach and add to the skillet; cook until it wilts, about 2 minutes. Remove from the pan, squeeze excess liquid and chop fine. Set aside. 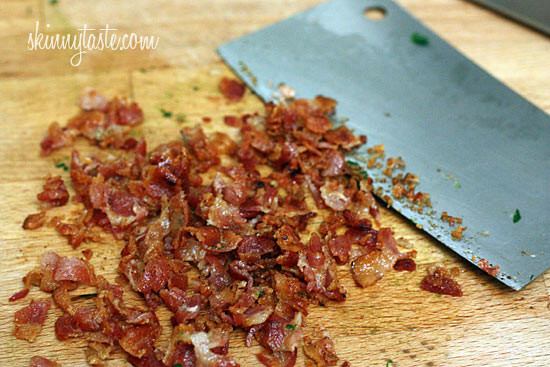 Dry skillet, add bacon to the skillet and cook on low heat until bacon is cooked through. Set aside on a paper towel. 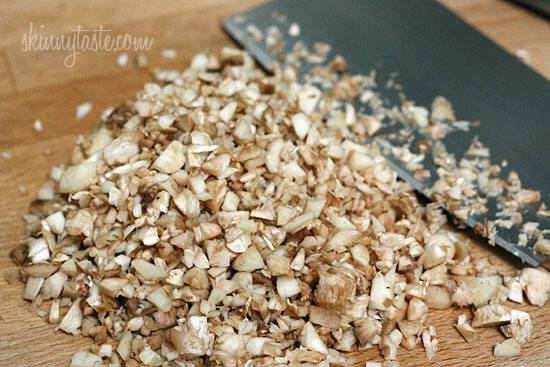 Coarsely chop. Clean skillet and add olive oil to the pan. Add garlic and saute until golden, about 2 minutes. Add minced mushroom stems and saute until soft, about 2 minutes. 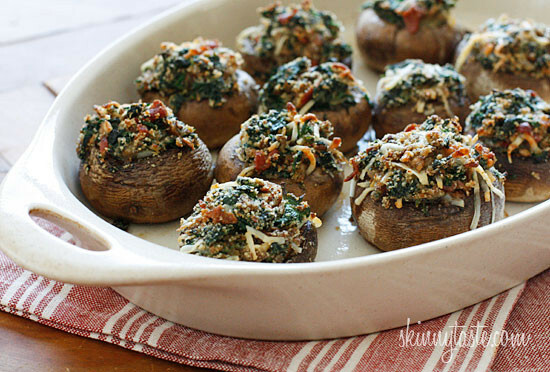 Remove from heat and combine mushroom stems with sauteed spinach, bacon, bread crumbs, and parmesan cheese. Season mushroom caps with salt. 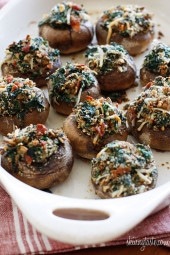 Fill mushrooms with spinach mixture, rounding tops off. Place on an oven safe dish and lightly spray the tops with oil. Bake 20 minutes or until golden. Eat warm.